Up To No Good – Mrs. Meers, the evil proprietress of the Hotel Priscilla (played by Kennedie Coyne), coerces her two Chinese assistants Bun Foo (Markus Harter – left) and Ching Ho (Michael Mankiewicz to assist in her illegal schemes. 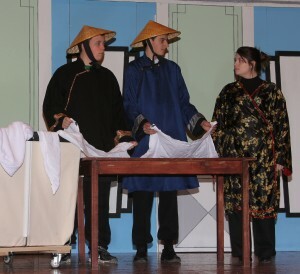 The scene is from the Quirk’s Players’ upcoming production of Thoroughly Modern Millie, which will be performed this week at Fulton’s G. Ray Bodley High School. Thoroughly Modern Millie, which will be presented March 5-6-7 at G. Ray Bodley High School.